SS Joachim and Anna, Jesus’ grandparents, are often referred to as the “ancestors of God.” St. Joachim was from the house of David, and St. Anna was of the tribe of Levi, and of the Kohanim, the direct descendants of Aaron the High Priest. They were quite wealthy and most charitable. They were married for 50 years, yet remained childless, which was most painful to them and a disgrace at that time in Israel. The Holy Archangel Gabriel came to them separately to tell them that they would bear “A daughter most blessed…through whom will come the salvation of the world.” After the Archangel’s greeting, they came together and embraced in joy at the Golden Gates of the Temple. One month later, St. Anna conceived, and so from them was born the Most Holy Virgin Mary. They had promised to dedicate this most special child to God, and so brought her to the Temple when she was just three, where the Virgin stayed until St. Joseph became her protector. 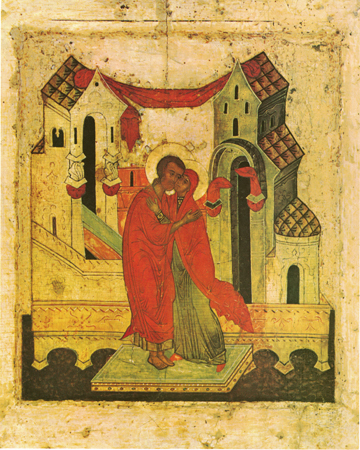 St. Joachim died at 80, twelve years after his daughter was born, and St. Anna lived as a widow in the Temple also, dying at 79 only after seeing and holding in her arms her grandson Jesus Christ.